During the warmer months, I often go for an evening run through the Scioto Audubon Metro Park, and I consider how this wetlands preserve was home to an impound lot and junkyard just a short time ago. In this location, I created a series of digital photographs using a hand-made camera obscura which utilizes a 2 1/2” inch sphere of ice as the lens. Through this mutable lens, I capture images of the Columbus skyline during the blue hour - the transition from daylight to nighttime. The space between. These images become less identifiable and more abstract as the ice lens melts. The fortified skyline becomes a wash of colors. The inverted and distorted images are not meant to confuse or obfuscate the subject of the photograph, but rather transform it into another means of expression. An ever changing city, simultaneously foreign and familiar to the residents that inhabit it. Since my childhood, my family would travel to Northern Wisconsin for a summer holiday in nature. We return to this location each year, and in doing so, mark a present moment in time that is often viewed through the memories of our past. In September, 2014, I was given the opportunity to create a show for Lumos Technology Gallery in the Short North Arts District in Columbus, Ohio. For that show, I wanted to reproduce bits of memory from Door County, Wisconsin - a place my family visits for a portion of each summer. A suspended video screen drew it's power from a solar panel placed in the front window. 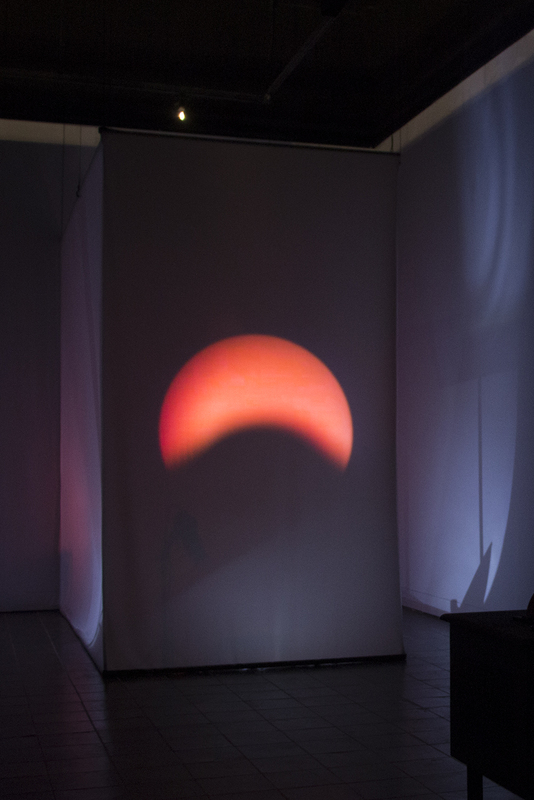 The video illustrated a looped moment of the last ray of sunlight as it dipped below the horizon line, and then slowly reversed to appear again. 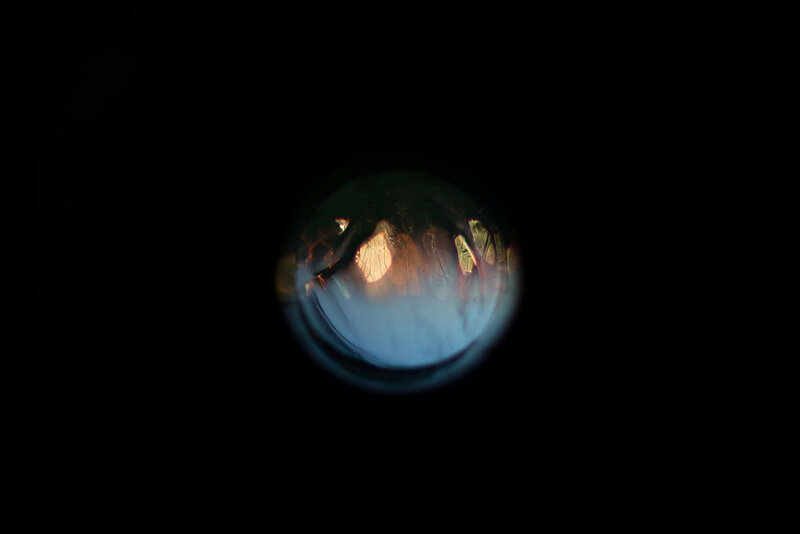 Next to the video was a black funnel protruding from a small wooden box, that released a series of three scents (wet earth, campfire, pine needles) activated by the viewer's presence. 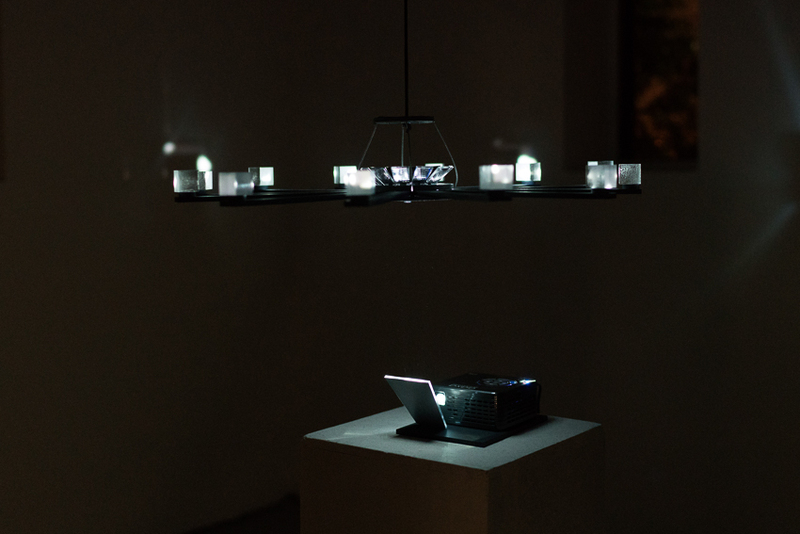 Simultaneously, a parametric speaker played the sounds of Kangaroo Lake at night, only audible when the viewers was in the direct path of the focused sound waves. Next to this piece, are two small walnut boxes with vintage projector lenses revealing two videos. The first video is of the Super Moon on Kangaroo Lake on a night in August 2014. The second video presents a candle and its reflection as it is blown to the point of extinguishment, and struggles to maintain it's flame. Two experiments were combined into one installation for the 32 Weeks Exhibition at CCAD. Both pieces deal with the idea of filters, and their ability to alter what is seen by the human eye (which could be regarded as a third filter). Four rotating films were projected through the first filter, water vapor. The projection then encounters physical object in the shape of an ellipse. This object has an abundance of fiber optic cables protruding from a grid-like surface. The structure of the grid is disturbed as the cables twist to meet the light from the video projection. Light travels in a straight line, but the twisted pattern of the fiber objects bend the light to create a distorted image on it's surface plane. This series of photographs was inspired by Naoki Higashida's book, The Reason I Jump. The book was written by a thirteen-year-old boy (Naoki) with autism. One passage in particular caught my attention. Naoki describes how he sees the world - ". . . the details jump straight out at us first of all, and then only gradually, detail by detail, does the whole image sort of float up into focus" (p. 59). With my digital camera and a macro lens, I studied the details of ice that had formed in my backyard in January, 2014.